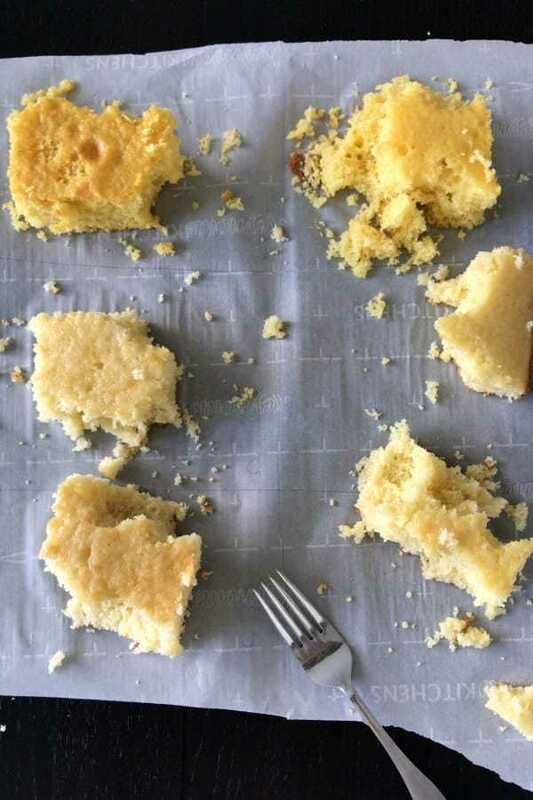 This Yellow Cake Recipe from scratch is a better-than-cake-mix yellow cake. 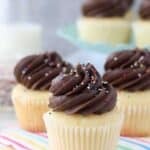 This recipe can be used to make a yellow cake or yellow cupcakes with a chocolate fudge frosting. 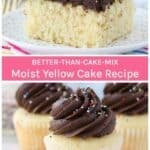 This homemade cake recipe uses oil, sour cream and buttermilk to create the perfect moist, spongy, yellow cupcake. At last! Time for a new cake recipe!! 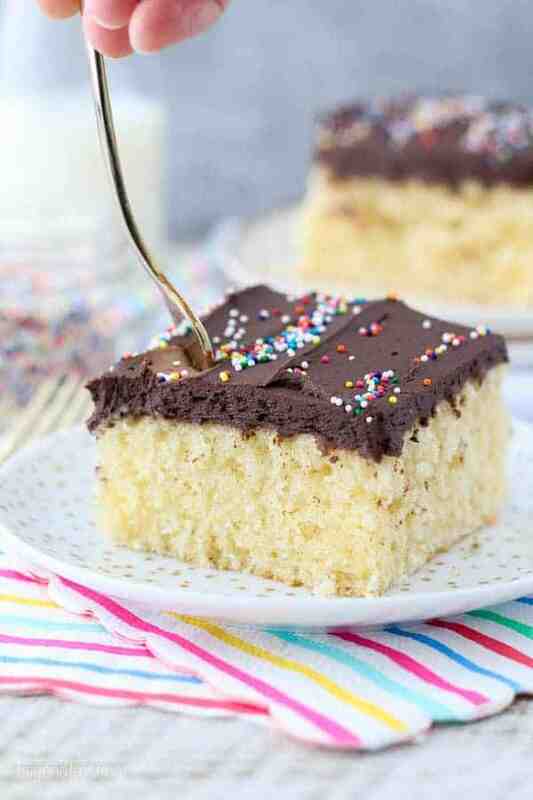 This one, you guys, this is the perfect homemade yellow cake recipe with a chocolate fudge frosting. Just for you. 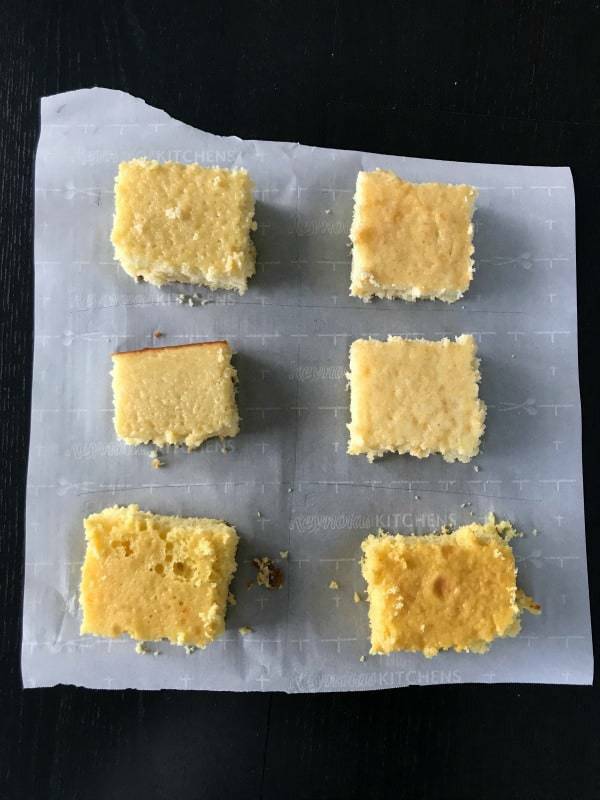 This is a long post that talks all about all of the recipe testing I did and how I landed on my final yellow cake recipe. So follow along or just skip past all of this and go straight to the recipe. 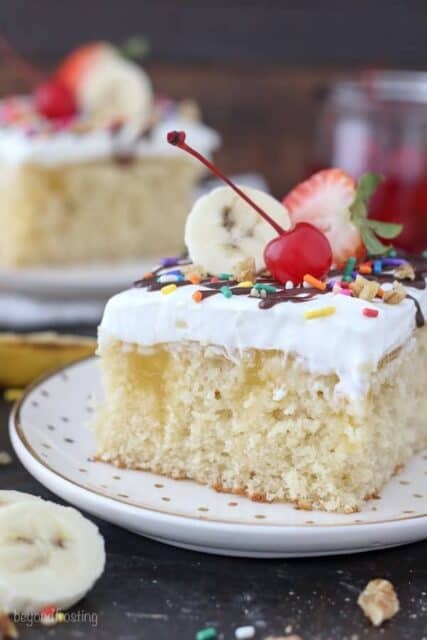 After perfecting my moist vanilla cake recipe, I wanted to make a yellow cake recipe that resembled what you’d get with a box of cake mix, except better. I wanted this yellow cake recipe to be less dense than my vanilla cake, with more air pockets, which would produce a more tender crumb. It needed to stay just as moist but be less like a sponge-cake. 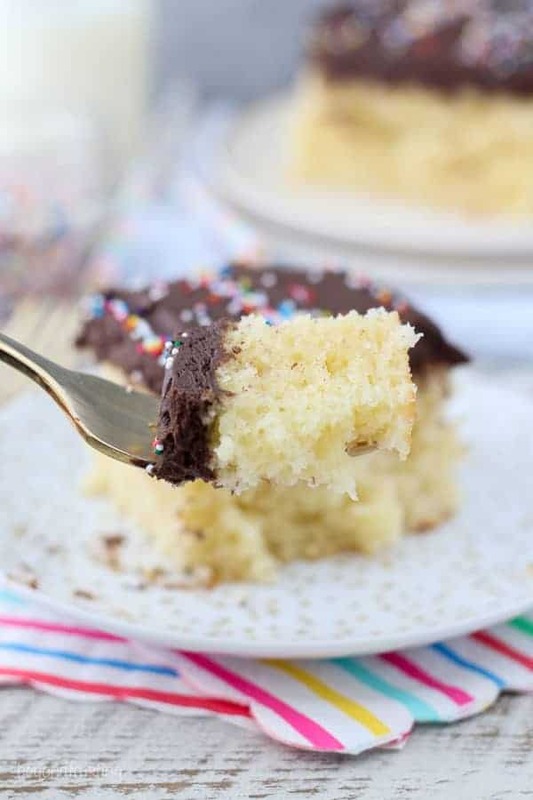 What’s the difference between a vanilla cake and a yellow cake? Flavor-wise, a yellow cake should have a less-strong vanilla flavor, but a buttery, “eggy” flavor, although I hate the term “eggy” myself. Other than that, there isn’t really a whole lot of different between the two. This set me off on a bake-a-thon where I baked 6 variations of the yellow cake and 2 boxed cakes just for taste comparison. The one thing that stayed consistent through my test is that each cake contained 2 whole eggs and 2 egg yolks and 2 teaspoons of vanilla extract. In each recipe, I adjusted the amount of sour cream and the liquid ingredients. We tasted each one and rated them for their taste, moistness, density and crumb structure. I also incorporated frosting into the test so that we were able to get the full effect of a finished cake. First, we tasted the sample cakes without frosting, to be sure we could focus on the cake flavor and structure. Once we landed on our top 2 cakes, we tasted them with chocolate frosting. One thing became very evident during our cake tasting: wherever we landed, it certainly wouldn’t be quite as yellow or produce that lighter-than-air texture you get from the box mix. The boxed cake mixes stood out like a sore thumb in our taste test. One because of the color, which is achieved by using food dye. Two, they tasted blatantly artificial in comparison. 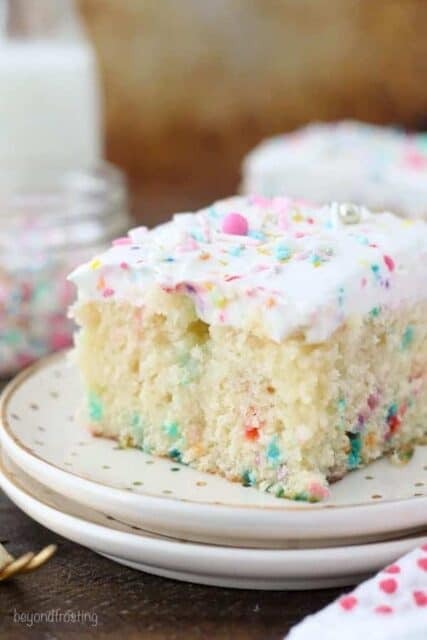 The more research I did on yellow and vanilla cakes, the more I read about the difficulty of achieving the same texture and consistency you’d get from a cake mix. I equate this to the chemicals used in cake mixes. That is why this recipe is a BETTER-than-cake-mix Yellow Cake Recipe. I’ve always preached the convenience of a cake mix, and plenty of my recipes on my site call for cake mix. However, the more I bake from scratch, the less I am grabbing cake mixes from my cabinet. The taste of a homemade cake simply can’t be beat. 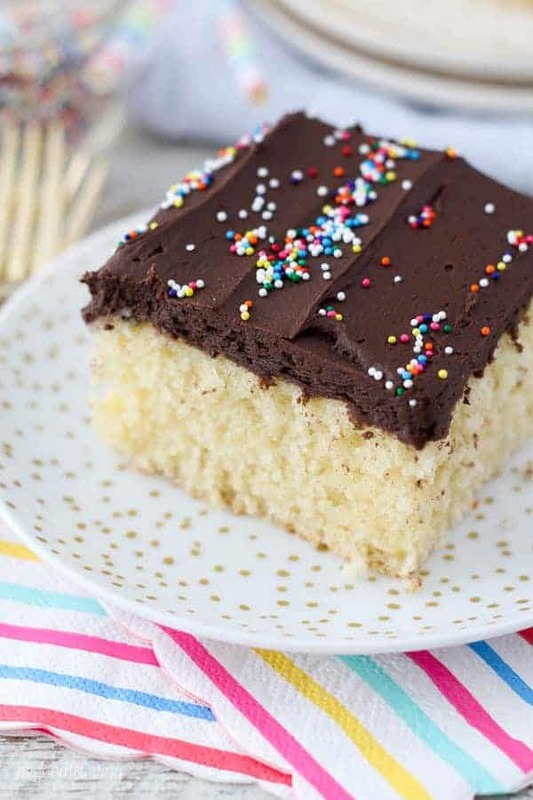 There’s a time and place for cake mix for sure, especially if you’re in a pinch. Anyhow, back to the recipe testing. After my first round of 6 different cakes, we landed on a favorite. I decided to do one more test and swap out one last ingredient that put this cake over the edge of good to great. Buttermilk. Cake #7 is the winner! Buttermilk is the primary liquid ingredient in this cake. Not only does it help achieve the slight tang, but it helps achieve a certain tenderness to the crumb. I know I’m going to get this question a lot, do I have to use buttermilk? Can I just use regular milk? The answer is yes, you can use regular milk. However, I personally feel that cake is way BETTER with buttermilk and it stays moist for a longer period of time. 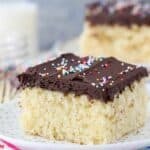 One reason readers love my moist vanilla cake recipe is because it’s convenient and doesn’t require any special ingredients. Buttermilk isn’t a common ingredient that most people just have laying around in their house, but you can also make homemade buttermilk substitute with some lemon juice or vinegar. I’ve also heard you can freeze leftover buttermilk. But my short answer? Yes, buy some buttermilk for this recipe. It’s worth it. Once I landed on cake #7, I baked it two more times to be sure I liked it, and then also tried another version altering the amount of buttermilk and sour cream just to be sure I had it the right way. One noticeable difference in this recipe compared to my moist vanilla cake is that the batter is a lot thicker. It will be interesting to see if this works better for cakes that have berries or other items incorporated into them. Once I nailed the perfect yellow cake, it was time to take on the frosting. I could have made a batch of my best chocolate frosting, but for this recipe, I wanted something fudgier than that. This chocolate fudge frosting uses a combination of melted chocolate and cocoa powder for a rich chocolate flavor, a little goes a long way here. 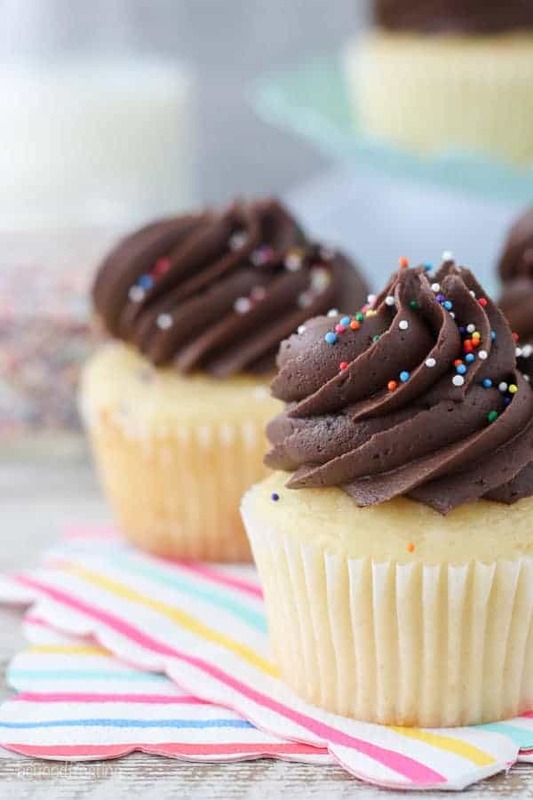 It’s important that you have high quality chocolate, because it will impact the taste of your frosting. I always recommend using a chocolate bar instead of chocolate chips. Chocolate chips tend to have a coating on them which, when melted, produce a more oily melted chocolate. I suggest melting the chocolate at 50% power so it doesn’t seize in the microwave. Like most of my frosting recipes, this one starts with cold butter. 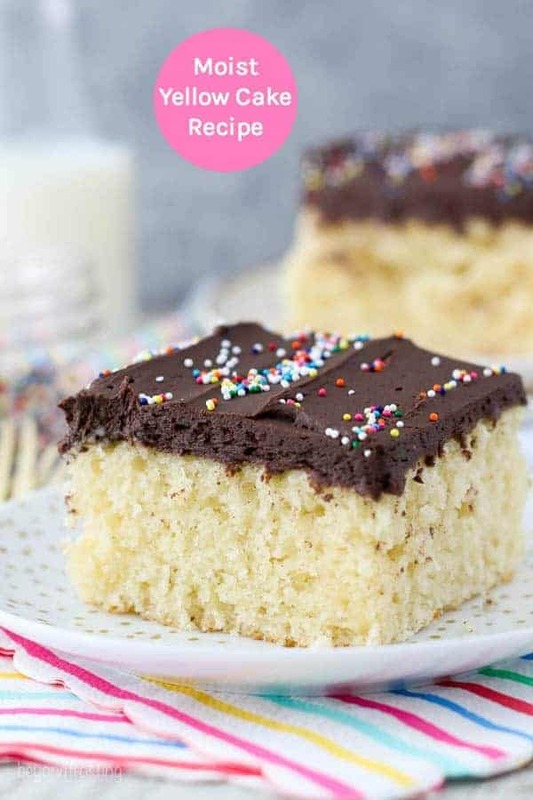 Through the process of whipping the butter at various stages, we end up with an airy chocolate frosting that is great for spreading and piping. The ratio of butter to powdered sugar is a little bit less than my standard 2 cups of powdered sugar to 1 stick of butter because I didn’t want a very dense frosting. This chocolate fudge frosting will crust over a bit, so if you want to add sprinkles, it’s best to do it right away. 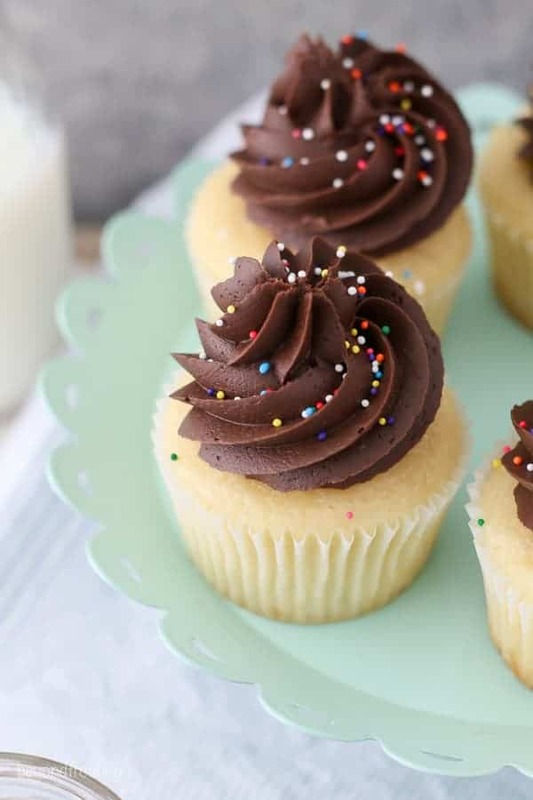 The great thing about this yellow cake recipe is that it can also be made into cupcakes. If you make the recipe as is, it should produce 24 cupcakes. However, I always like to provide the option for 12 cupcakes in case you don’t need quite as many. To make 12 cupcakes, half all the dry ingredients and wet ingredients as well. 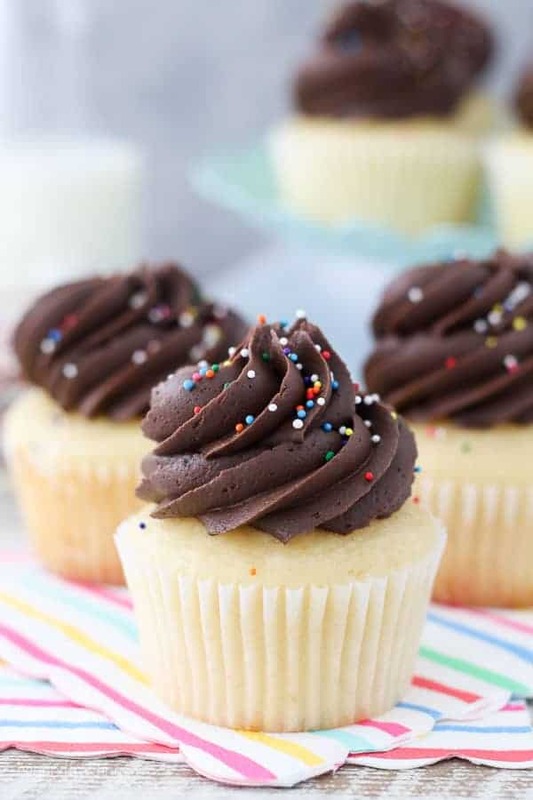 You’ll need 1 whole egg and 1 egg yolk, 2/3 cups butter milk and 2 tablespoons of sour cream to make 12 cupcakes. You can still bake at 350° for about 15 minutes. For the cake: Preheat the oven to 350°F. In a large mixing bowl, combine the sugar, vegetable oil, eggs, egg yolks and vanilla extract. Beat on medium speed until the eggs and oil are well incorporated and the batter is lighter in color, about 2 minutes. Scrape down the bowl as needed. Add half the flour followed by the baking powder and salt, and beat on low speed while pouring in half of the buttermilk and mix just until the flour starts to incorporate. Pour the batter in a 9-inch by 13-inch pan and bake at 350°F for 28-30 minutes, keeping a careful eye on the baking during the last few minutes. Remove from the oven and allow to cool completely. Test the cake for doneness by inserting a toothpick into the center of the cake. If the toothpick comes out clean, your cake is done. Cool completely. 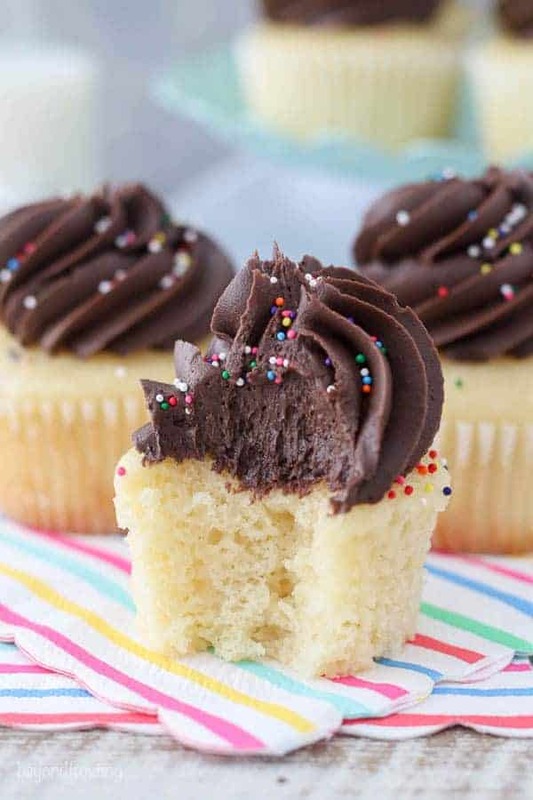 For the frosting: In a microwave-safe bowl, melt the chocolate in the microwave at 50% power in 30-second increments, stirring each time until the chocolate is melted. Stir until completely smooth. Set aside to cool. Cut the butter into pieces. Using the paddle attachment, whip butter for 5-7 minutes, scraping down the bowl occasionally. Beat until butter look light in color. Next, beat the cocoa powder into the butter until well mixed. Alternate adding 1 cup of powdered sugar at a time with the liquid ingredients: vanilla extract & heavy cream. Ensure the powdered sugar is well combined, and whip for 1-2 minutes before adding more powdered sugar. Next, pour in the melted chocolate and beat on slow speed until incorporated. Then, increase the speed to medium-high and beat for another 2-3 minutes to whip additional air into the frosting. Spread over cooled cake. In a large mixing bowl, combine the sugar, vegetable oil, eggs, egg yolks and vanilla extract. Beat on medium speed until the eggs and oil are well incorporated and the batter is lighter in color, about 2 minutes. Scrape down the bowl as needed. Cut the butter into pieces. Using the paddle attachment, whip butter for 5-7 minutes, scraping down the bowl occasionally. Beat until butter look light in color. Next, beat the cocoa powder into the butter until well mixed. Scrape down the sides of the bowl. Next, pour in the melted chocolate and beat on slow speed until incorporated. Then, increase the speed to medium-high and beat for another 2-3 minutes to whip additional air into the frosting. 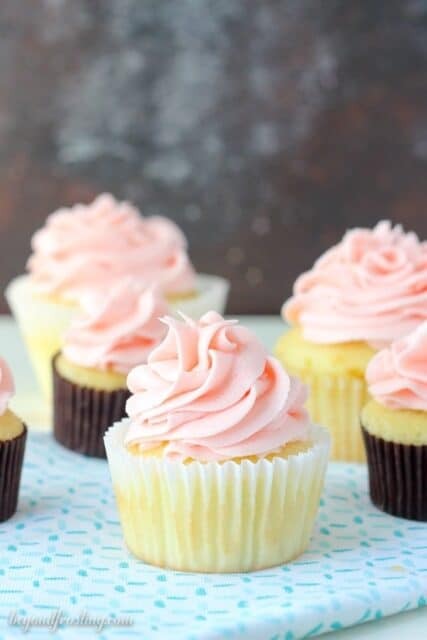 Use a large open star tip to pipe these cupcakes. I made this cake (9×13 Pan) and it was FABULOUS! I want to make it again as a layer cake. Will this recipe make two 9in rounds? If so, how long should I bake them for? Hi Michelle, that is awesome! Thank you for sharing! Yes it can be made in 2 9 inch layers. 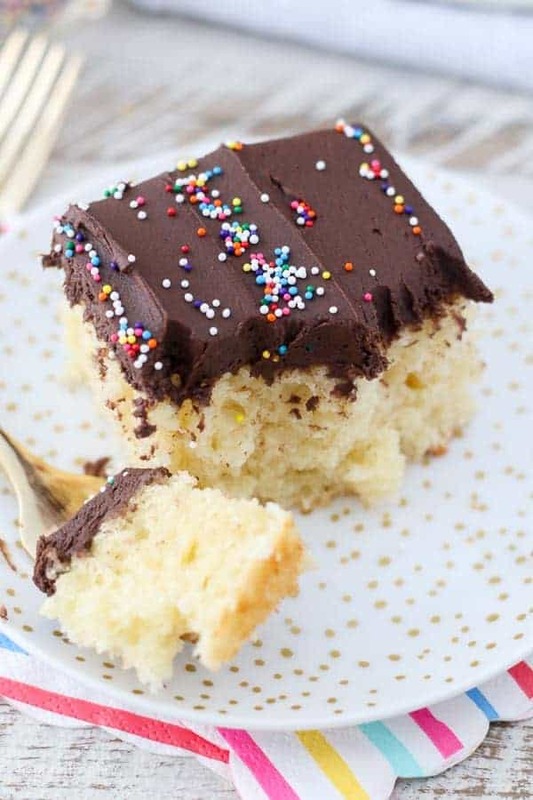 For my vanilla cake, the 9 inch layers bake for 28-32 minutes, but this recipe is a little bit different, so I would start with 25 minutes and then keep a close eye on it, checking every few minutes after that. Enjoy!